This entry was posted in Betsy DeVos, Vouchers and tagged BEP in Tennessee, Dolores Gresham, Vouchers in Tennessee. Bookmark the permalink. This revelation is painful. We are back to the “teachers are the problem” era again. No, we don’t forbid Johnny the tax dollars because of ed. unions (of which I am not a member). We don’t want the tax dollars to go to Johnny’s school of choice does not have to follow ANY of the state and federal laws required of public schools (and that’s whether the public schools or their teachers agree with those laws or not). Drain the swamp! And what is the purpose of all the math below the email box? The “math” is to prevent spam. Thanks! I think you mean a “lack” of basic understanding. If people want to pay for private school that is fine. I don’t want my tax dollars going to private schools. Students are cash centers for a lot of charters that are in the education business to make money. Thank you for highlighting this alarming reality. Whether you support vouchers or not, HER attitude and use of FALSE reasoning is not fitting for someone who holds such a position. 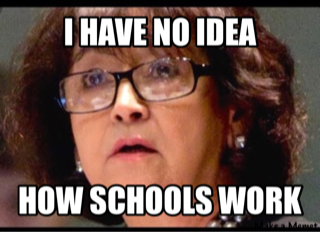 Her blatant disregard for public educators AND THE CHILDREN (aka the FUTURE) of Tennessee combined with the lack of knowledge about how the system actually works is exceedingly incredible. We are at fault if we let this blatant waste of taxpayer funds continue.